Mr. PAUL. Mr. Chairman, I move to strike the requisite number of words. Mr. Chairman, I rise in strong support of this amendment. I want to compliment the gentleman from California (Mr. DOOLITTLE) for offering it. Certainly, if nothing else, we ought to protect the rights of individuals and groups to distribute voter guides. There is an argument here whether or not it is actually doing this. But, obviously, the Member from California feels strongly that this is necessary in order to protect this right. There has been a lot of talk here about soft money. I just often wonder about soft money. I know something about hard money. But this business of soft money and soft money automatically being bad is something we should think seriously about. Because so often when we are talking about soft money, we are talking about the peoples money, their money, their property. Sure, it is a first amendment right. But there is also a property rights issue here. When people have money, they have a right to spend it; and if they want to spend it on a voters guide, they certainly ought to be able to do this. So I think it is a very important amendment and we should pay close attention to this to make sure that we pass this amendment. The problem with attacking big money without knowing why there is big money involved in politics I think is the problem that we face. Big money is a problem. They are spending $100 million a month to lobby us in the Congress and hundreds of millions of dollars in the campaign, but nobody ever talks about why they are doing it. There is a tremendous incentive to send all this money up here. Unless we deal with the incentive, we cannot deal with the problem. So, so far, almost all the talk that we have heard on this campaign finance reform is dealing with the symptom. The cause is Government is too big. Government is so big there is a tremendous incentive for people to invest this money. So as long as we do not deal with that problem, we are going to see a tremendous amount of money involved. But what is wrong with people spending their own money to come here and fight for their freedom? What if they are a right-to-life group? What if they are a pro-gun-ownership group? What if they are a pro-property-ownership group? Why should they not be able to come and spend the money like the others have? It just seems like they have been able to become more effective here in the last few years, and it seems like now we have to clamp down on them because they have an effective way to come here and fight for some of their freedoms back again. So I think that we are misguided when we talk only about the money and not dealing with the incentive to spend the money, and that is big government. All the rules in the world will not change these problems. We had a tremendous amount of rules and laws written since the early 1970s and all it has done is compounded our problems. So I think openness and reporting requirements to let people know where we are getting the money, let the people decide if we are taking too much from one group. But to come down hard and attack on individual liberty and the right for people to spend their money and the right for the people to distribute voters guides, I cannot say see how that is going to solve any problems. I mean, what are we doing here? I think it is total foolishness. So I strongly endorse this amendment, and let us hope we can pass this amendment. 1998 Ron Paul 67:4 a first amendment right probably should be capitalized, a First Amendment right. 1998 Ron Paul 67:9 all it has done is compounded our problems probably should be all it has done is compound our problems. 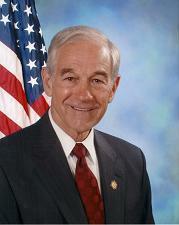 1998 Ron Paul 67:12 I yield to the gentleman from California. Here, Ron Paul yields to The Honorable John T. Doolittle.